Falling Waters State Park is home to a 73 foot waterfall. 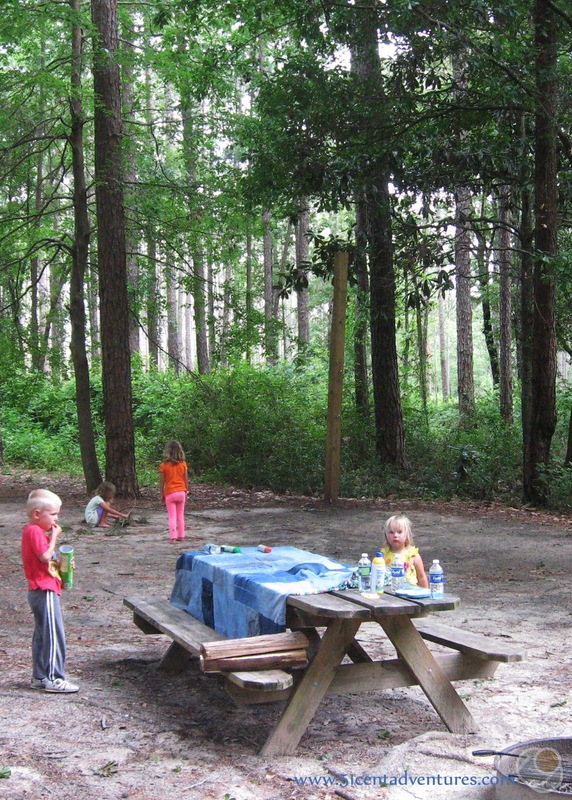 The state park also has a campground with 21 spots. 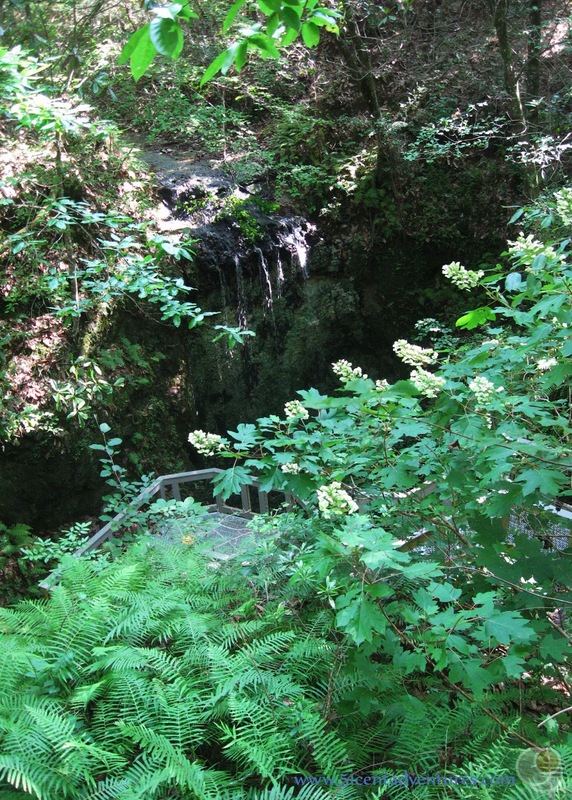 The campground is located just a short hike away from the small lake that feeds the waterfall. 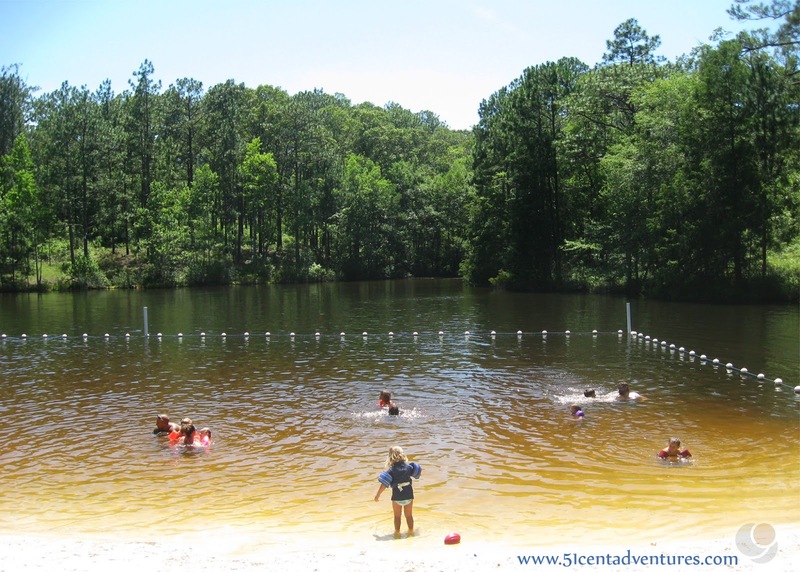 The lake has a small beach that is perfect for swimming on hot summer days. 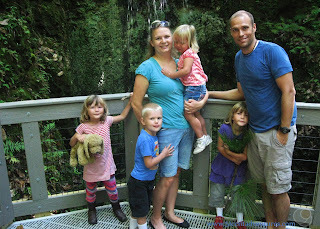 My family visited Falling Waters State Park for the first time in February. We all enjoyed the waterfall, the walking trails, and the lake. Before we left I promised the kids that we'd come back and swim in the lake when the weather warmed up. That promise was in the back of my mind as I planned a four day weekend camping trip for Father's Day. 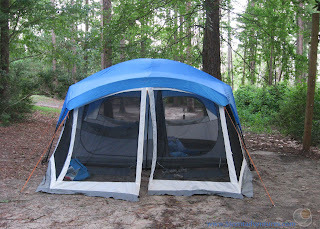 I wanted to camp on the Gulf of Mexico each night, but by the time I started booking campsites I could only get one night at St Andrews State Park. 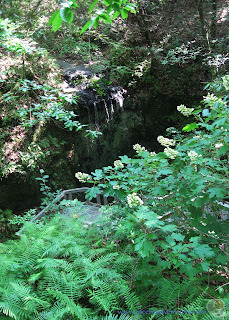 I looked around and found that Falling Water's State Park had open sites. Even though Falling Waters State Park is about an hour away from the Gulf of Mexico I remembered that it had a small swimming beach by the lake. So I hurried and booked our remaining two nights for Falling Waters. This actually worked out better than I thought because the campground at St Andrews was incredibly crowded. I didn't know it was possible to cram that many campsites into that area. We were uncomfortably close to neighbors on both sides of our campsite. I'm not sure I would have liked to stay there longer than one night anyway. In contrast, each campsite at Falling Waters campground was much more spread out. It only had 21 campsites total so it was a much more intimate place. 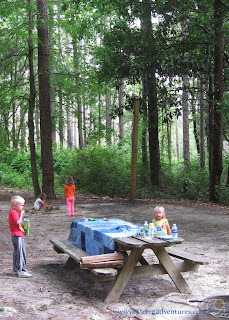 We arrived in the late afternoon so we spent our time setting up the tent and making dinner. 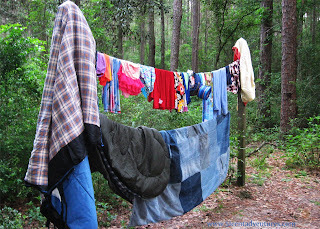 All of our swimming suits were still damp from our beach adventures that morning so we hung them up to dry on the clothesline that was set up. In addition to supporting clotheslines, these posts could also be used for hammocks. It's illegal to tie anything to a pine tree in a State Park in Florida so that's why the posts were provided. On Sunday morning we decided to take advantage of the relativity cool morning temperatures and walk to the waterfall from our campsite. The trail was gravel for the hike down from the small hill where the campground was located. Then it turned into a boardwalk. Along the way there were information signs indicating the type of plants we were passing. I always appreciate these signs since I'm not from the south. 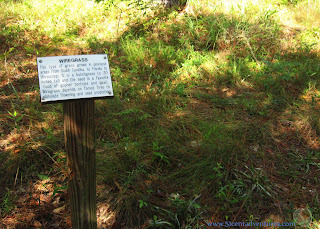 We were able to see actual Wiregrass. The whole tri-state region of Southern Alabama, Southwestern Georgia, and Northern Florida is known as the Wiregrass region. It's named after this wiry textured grass. When this area was first settled the grass was plentiful. However, the grass is actually quite rare these days, since the grass seeds need fire to germinate. 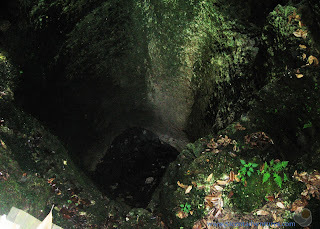 Soon we came to where we could see the edge of the sinkhole with the waterfall flowing over it. Last time we came here, the lower viewing platform had been under construction. This time the lower platform was complete and so we could go down there and get a good look at the waterfall. 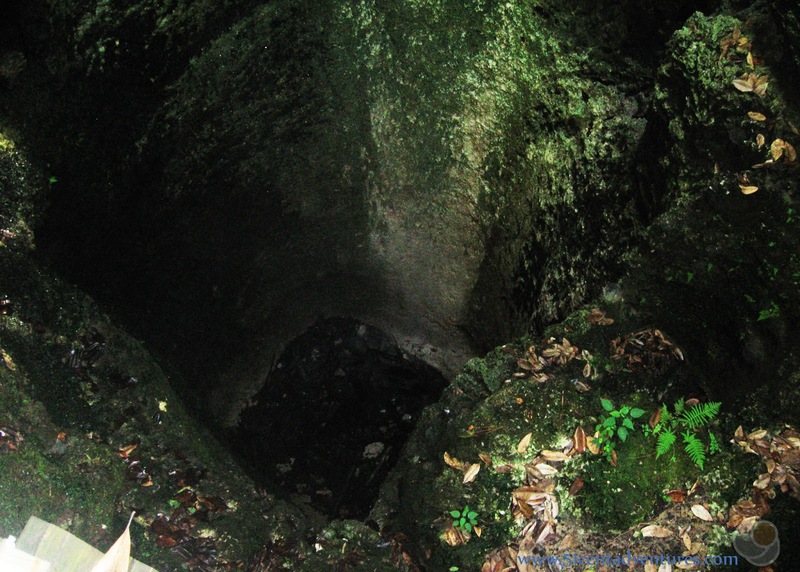 We could also see into the sink hole. It was like looking into an elevator shaft. 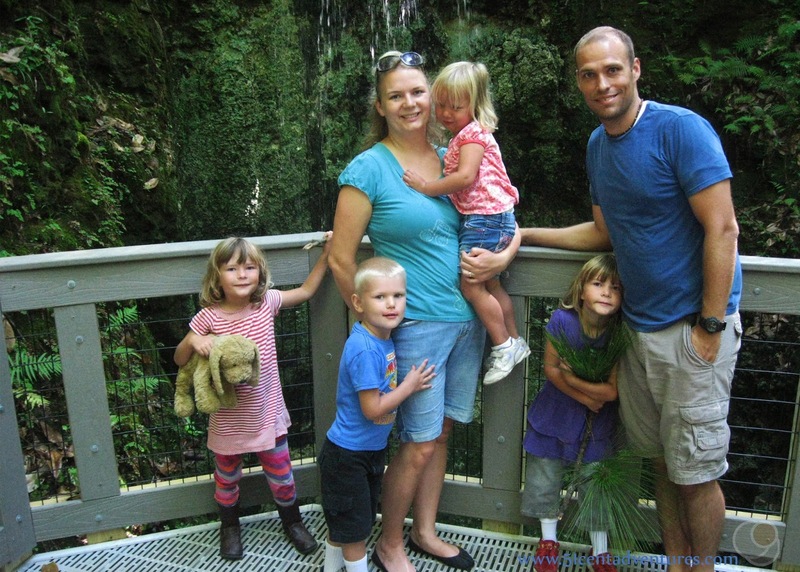 I wanted a family picture with the waterfall. Some kids were happier about it than others. Our hike back to the campground wasn't as idealic as our walk down had been. 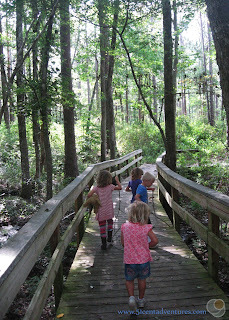 We were heading up hill most of the way, it was hot, and the kids were hungry. We made it back and then packed the kids up in the car so we could drive around and let the kids take a nap in the car. (It was too hot to let them sleep in the tent.) We drove to DeFuniak Springs and explored around the lake there. Later in the afternoon we came back to the state park. We changed into swimming suits and hiked down to the lake. Back when we came in February the water had been too cold for swimming. But in the summer it was perfect. The lake had bathrooms located just a few feet from the shore. These bathrooms had running water. Back at the campsite there were more bathrooms and a bathhouse where we could take hot showers. We spent another lovely (albeit hot and humid) night camping at the park. The next morning the kids woke up early as we had expected. So we quickly packed everything up and drove back down to Panama City Beach. We spent several hours playing at one of the city beaches. The drive between Chipley and Panama City took about an hour. I was glad that we were closer than we would have been if we were coming from Fort Rucker. 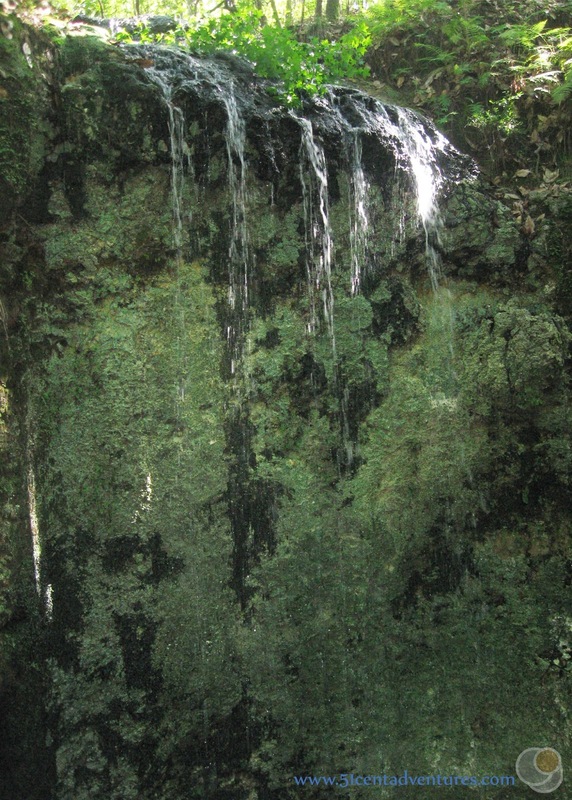 Recommendation: Falling Waters State Park is an often overlooked park in Northern Florida. But that makes it even more special for the people who choose to seek it out. Its a great place for a day trip and the campground is nice too. It's a nice alternative to crowded beaches on the ocean. 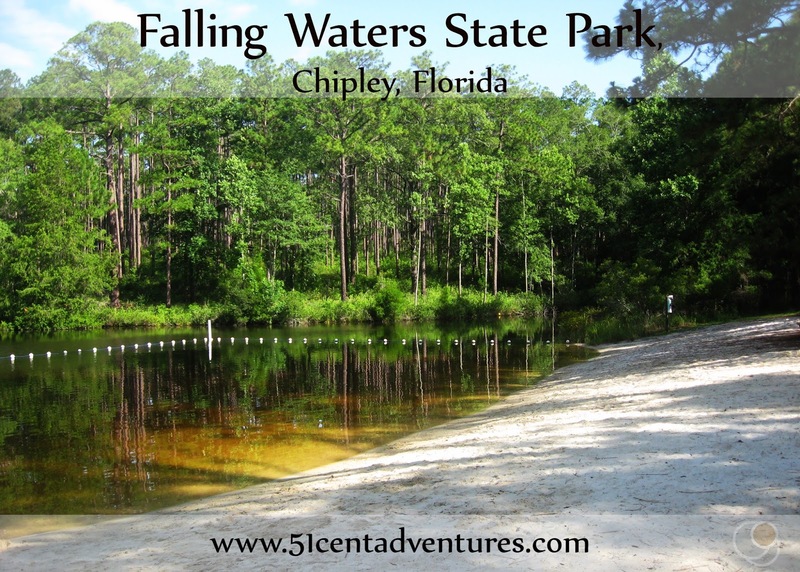 Directions: Falling Waters State Park is located 3 miles south of Chipley, Florida. It is less than a mile from the I-10. Take Exit 120 and turn south onto FL-77. Take the first left onto 77A which is also known as State Park Road. That road will lead straight to the park entrance. Places Nearby: The Seacrest Wolf Preserve is located 15 miles from the State Park. This preserve offers tours that allow you to see and touch wolves as well as visit their natural habitat. The cost of the tours starts at $25 a person, but this is a great opportunity if you love wolves.